I was very pleased to see that my first pair of released grey partridges are still hanging around the remains of the game cover. I was worried about them after five and six foot high snow drifts buried their feed hopper, but was planting blackthorn trees in the new hedge this morning and heard a very familiar little chuckle coming from the open field behind me. I had to look for some time before I saw the two little shapes dustbathing on a pile of molehills fifty yards away. Their camouflage really is quite impressive, and by the time that I had run back to the car for the camera, I then had to look hard to find them again. It really was a huge pleasure to see these birds. Grey partridges were originally a bit of an offshoot of my black grouse project, but they are fast becoming firm favourites. Deep stripes of snow still run in parallel lines across the remains of the game cover, but in two months it will be under a new mixture of seeds. I was particularly impressed with wild flower mixes last year, and I was thrilled that the radish flowers attracted enough insects to draw in a family of spotted flycatchers. I need to put some thought into precisely what I will sow this year, and I’m already looking forward to it. Having spent four years dancing around the issues presented by a long forty yard wide band of sitka spruce trees across the middle of the Chayne, the past few weeks have been spent taking matters into my own hands. The wood is too small to make it viable for a proper harvester to come up on the hill and take the timber out, and during the twenty five years since it was planted, the ditches and drains around the upper reaches of the wood have made access impossible, even for soft tracked vehicles. These trees are now destined to do nothing more than rise up to a critical height before gradually falling over like leggy weeds and crushing the fences. During their lives, they will probably do little more than give crows somewhere to nest and provide goshawks with perches from which they can survey the open moor. For every reason, these trees need to be knocked over, and given the terrible access, the majority of wood will have to be left where it falls. I can extract most of the timber from the track which runs along the south side of the trees, but carrying logs by hand over five hundred yards of wet bog from the northern end of the strip is just not worth my while. Having established the mission, you would think that it is pretty straightforward to knock over a sitka plantation. I suppose that in principle, the job is quite easy, but when you’re trying not to let anything fall onto the fences which run on either side of the strip, complications do start to arise. During the autumn, I felled all of the trees on the west side when the prevailing south westerly wind was pushing them into the plantation. These trees just leant inwards and rested against the main bulk of the plantation. Over the past few weeks since the wind has been in the east, I repeated the process on the other side of the wood (which runs from north to south), so that all the trees on the outside were leaning in towards the middle. With a few irritating exceptions (mainly doubled trunked trees which had too much weight on the outside and just sat back on the saw no matter what I did), I then reached a stage when a one hundred yard long section of trees had been folded in on itself. The bulk of the trees in the middle of the strip then needed to be removed. After a few failed experiments, I found that the best way to knock these trees over was by cutting them diagonally across the trunk in a single straight line, starting high on one side and working the saw down until the weight of the tree began to shift and press against the bar. I would then pull the saw out and cut in from the bottom at the same angle. With a sudden jolt, the whole tree slips diagonally off its stump but is held in a vertical position by the canopy above. It’s then either possible to keep putting these diagonal cuts in until the tree has vanished into a series of slanty sections or just moving on to the put the same cut into the next one. With the trees on the outside leaning in, the weight was distrubuted like a safety net so that nothing could fall out of the wood and damage the fence. I daresay the main reason why this diagonal cut has not received widespread attention as a felling technique is because it is somewhat dangerous. Nine times out of ten, the tree falls off the stump exactly as you hope it will. But without leaving a hinge to control the direction that the tree will fall (as per conventional tree felling), there is the odd curve ball. This is particularly true when you have ten or fifteen trees all off their stumps leaning all their weight in a particular direction and, working under a particularly thick canopy, you fail to spot it. There were one or two hairy moments, but it’s all part of the fun of killing sitka spruce trees. I am extremely encouraged by the progress I’ve made on getting rid of this wasted strip. When it was planted, there wasn’t a great deal of thought put into how it would be harvested, so rather than let it grow cold and draughty, this particular section is now lying dead on its side. I’m planting birches and rowans where I can find gaps in the brash, and as the years go by, more gaps and bare ground will appear. I’ve seen how quickly self-sown sitkas come back under the wreckage of clear fells, so if my birch wood does develop a sitka understorey, I will not be altogether heartbroken, provided it stays low and stunted. A chainsaw may help to keep it low. 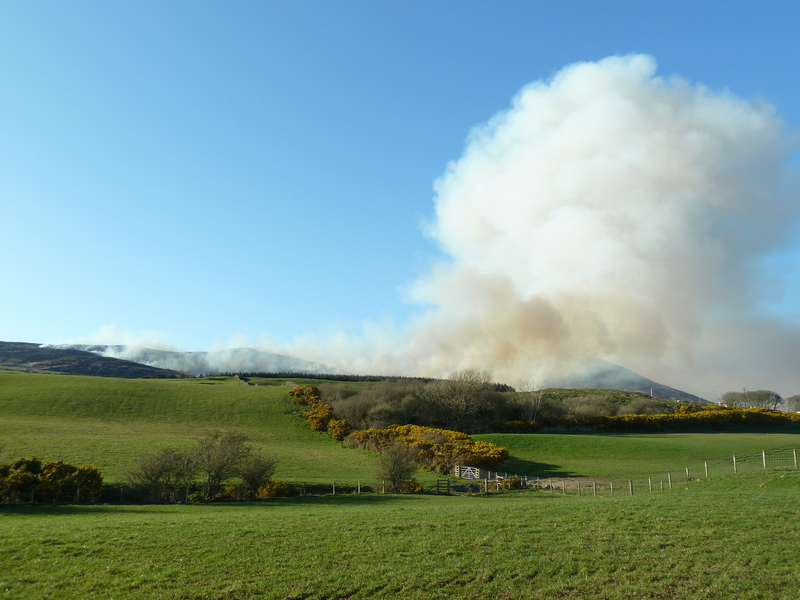 Just worth recognising the first anniversary of the “big fire” which I was involved in last year on a hill down by the Solway Coast. Over the course of twenty four hours, a thousand acres of heather went up in smoke as a routine back burning exercise got out of control. I doubt that I will ever forget that sequence of fear, exhaustion and excitement, and I must say that is as close to being in a war-zone as I ever hope to be. The word “epic” is thrown around a great deal these days, but it’s hard to think of any other way to describe the eerie thrill of seeing grouse flying in pairs through sheets of orange flame at midnight, when the fire stretched on a head that was hundreds of yards wide, criss-crossing back and forth on the broken ground and raking through banks of scree and rank heather. Likewise, seeing fire trickling with relentless energy through moss and stones despite energetic beating still makes my hair stand on end with horror. At one point, we tried to make a stand and burn back into an area of fire as it approached. Waiting in the darkness, the torrents of smoke slowly crept towards us until, at fifty yards away, the heat scorched our cheeks and sent us dashing back to the low ground, defeated and without a hope of regaining control. Roe deer stood in small groups in the open fields like sheep, evicted by the smoke and wondering what was happening. I will never be wholly comfortable with the idea of heather burning again, but that is probably a good thing. Fire is a great deal more than a simple management tool, and while there’s no doubt that it is indispensable as a means of managing heather, seeing it run wild is certainly a humbling experience. Now that the dust has settled, it’s obvious that the despite the chaos and upset, the fire has done a great deal of good for the heather on the hill. New plants are already coming back, and there are now carpets of blaeberry where before there was nothing but knee-high swathes of mature heather. In a few years, things will be looking very bright, but the main loss in the meantime is not having a huge amount to burn this spring. 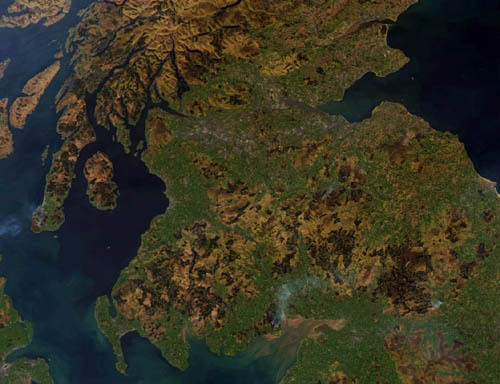 A picture of the fire (bottom, centre) taken by weather satellite 400 miles above the surface of the earth. It is interesting to see SNH’s push to celebrate Scotland’s “Big Five” in the name of “2013: Year of Natural Scotland”. The animals chosen to represent Scotland’s wildlife are red squirrels, grey seals, red deer, otters and golden eagles. It is difficult to see the purpose of the Year of Natural Scotland other than appealing to that marginal but significant body of people who are apparently so devoid of inspiration and vigour that they blandly sit around waiting for government bodies to suggest activities for them to do. For these folk, the Year of Natural Scotland is a veritable bonanza of guided walks, demonstrations, colouring-in sessions and opportunities to leave sandwich boxes under hedges. Perhaps I shouldn’t be so cynical. My interest in the “Big 5” comes down to the fact that these are the animals that we want to show the world. It says a great deal about Scottish conservation to (in the butchered words of Burns himself) “see oorsels no’ as ithers see us, but as we want ithers tae see us”. It did make me laugh to remember that the expression “Big 5” was first coined to describe the five African species which were traditionally found to be the hardest to hunt on foot (elephant, rhino, leopard, lion and buffalo). It conjured up mental images of tourists flocking to Scotland to shoot squirrels and otters, but I suppose that the expression has been so far distorted into the realm of the binocular safari now that it only has resonance as a box ticking tourist’s phrase. SNH’s “Big 5” were apparently chosen in order to generate discussion and controversy, so I will try to indulge in neither of these. Suffice it to say that four out of those five species probably deserve their places. Whoever thought that seals needed to be included ought to have their head examined. Perhaps my time working on a hebridean fishing boat have soured me against those overweight, salmon-munching water hogs, but it does seem a travesty when there are so many endangered species which deserve a bit of publicity. I daresay seals were chosen largely because it’s easy to see them – a conspicuous species allows families with small, cold children to get involved. It would be nice to include ptarmigan on the “Big 5” list, but getting people out of the car and up a munro to see them creates a number of problems. It seems then that these animals have not only been chosen on account of their symbolic status, but also because the average member of the public who doesn’t know or care about wildlife can (with a minimum of effort) feel engaged. And I suppose that’s the point of it. Since I don’t want to enter the discussion, it would be too much for me to put forward my own Scottish “Big 5”. But it would be black grouse, wildcats, killer whales, short eared owls and red deer. Now that the thaw is starting to set in, it seemed worthwhile to try and finally get up to the Chayne. After all, having been snowed into the house for two days and beginning to get a touch of cabin fever, the seven mile walk up to the farm and back suddenly had the appeal of variety. It’s not much more than two miles from my house to the Chayne as the crow flies, but the nature of the land has meant that the road winds far off to the east, before doubling back on itself and crossing a network of burns on its way uphill. The direct route is largely through blocks of forestry, so walking on foot is a compromise between the road and a number of shortcuts which roughly resemble a straight line. After an hour and half with a backpack full of wheat, I started to struggle, so it was a pleasure to finally dump the wheat where it was most needed in the two hoppers which the grey partridges are using. One had run out altogether, and the other was down to its final scraps. Footprints in the snow revealed where the partridges had been picking through the remains of the rotten turnip seeds which they’re being fed at the moment. I was starting to phase out their feeding as the spring came in, but it seems like the so called “hungry gap” has been unexpectedly protracted. The snow has started to recede during the past few hours, but the deepest drifts may well take weeks to vanish. 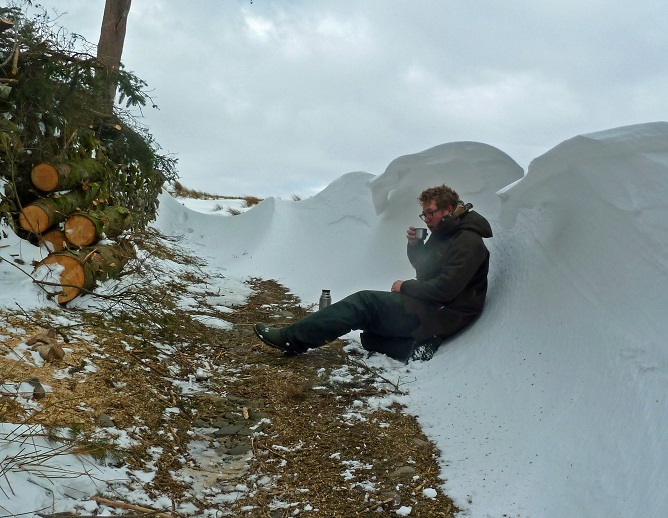 Once up on the hill, I came across some quite impressive snow drifts, including one which had blown eight feet high through a gateway and stretched back to a fine taper almost twenty yards away. With the exception of a few determined skylarks and a raven, there was not much to be seen. The snipe were congregating around the burns which still had visible water gurgling slushily down them, and I followed the tracks of an otter for a short stretch where it had scrambled over the powdery stones and splashed through the peaty ice. Having posted yesterday about the snow, I have now to report that the situation has deteriorated quite dramatically. There has been no real snow for the past twelve hours, but the powder that we received yesterday has simply shuffled around into a more comfortable situation. The drifts are harder, taller and more angular than they were, and a constant mist of stinging grit comes swirling around them. The dykes have almost vanished, and the grating powder hisses like an army of adders as it scours out the space between the coping stones, leaving an ugly jaw of broken teeth where a wall should be. Gradually, the drifts have built ramps over all obstacles, and the hawthorns down by the loch fan out the spray like the smoke from a dozen chimneys. It’s as if the valley is on fire, swirling vicious white fumes from the south east – fumes which scrape and sculpt the stubborn drifts into solid artefacts – making it appear as though something substantual is under those sharp, mathematical curves. In fact, it’s merely a trick of the wind – the physical manifestation of draughts and currents in the air. Some are simply waving dunes, like the snaking mound which now runs in a rampart three feet high across the yard. Others express the meeting point of a number of slicing eddies – there are sculpted cliffs and breakers like this one in the photograph. Six feet high at its peak, this particular drift has crept like sand until it stood squarely over the partridge breeding pen which I photographed yesterday. It took half an hour to dig it back and let some sunlight into the pen, and I half expected to find dead birds lying beneath the powder. 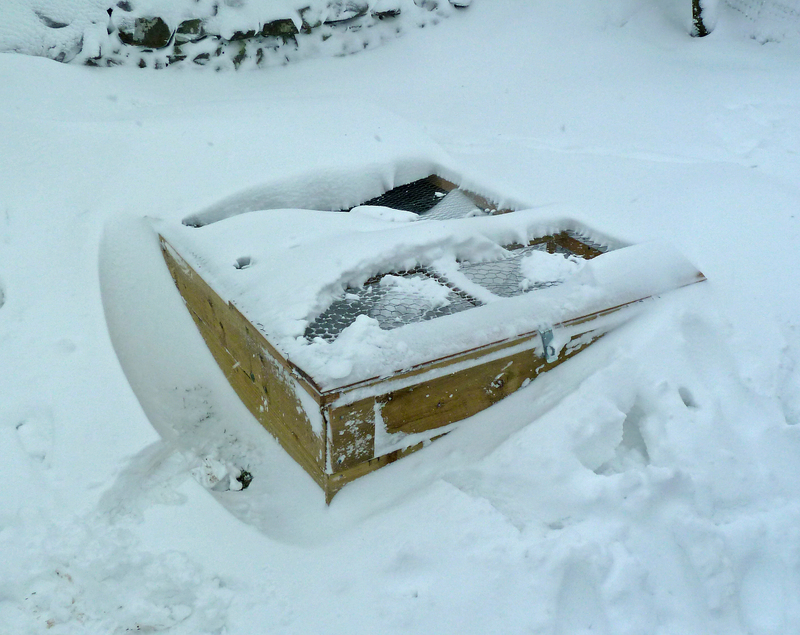 As it was, I finally cleared enough to lift the outer door and saw a hen partridge poking her head meekly out of the sarking board box at the other end of the enclosure. They’re both doing very well under several feet of snow, and I made sure that they had access to their feeder and drinker before going on to check on the other birds. Three hours later, the waving drift has almost entirely rebuilt itself and should probably be cleared again before dark. It was interesting to watch my pet blackcock digging a snow shelter for himself, scratching the powder behind him like a foraging hen and finally settling down in a hollow space about the size of a rugby ball. As I type, there is a thee inch square hole in the drift which indicates where he is lying, but it would otherwise seem like an empty pen. I’ve hung an old bedsheet up one side of the pen to give him some shelter, but the way the icy grit swirls and bends around obstacles, it doesn’t seem to be doing much good. Next door’s keeper came over to tell me that he had tried and failed to get out onto the main road. 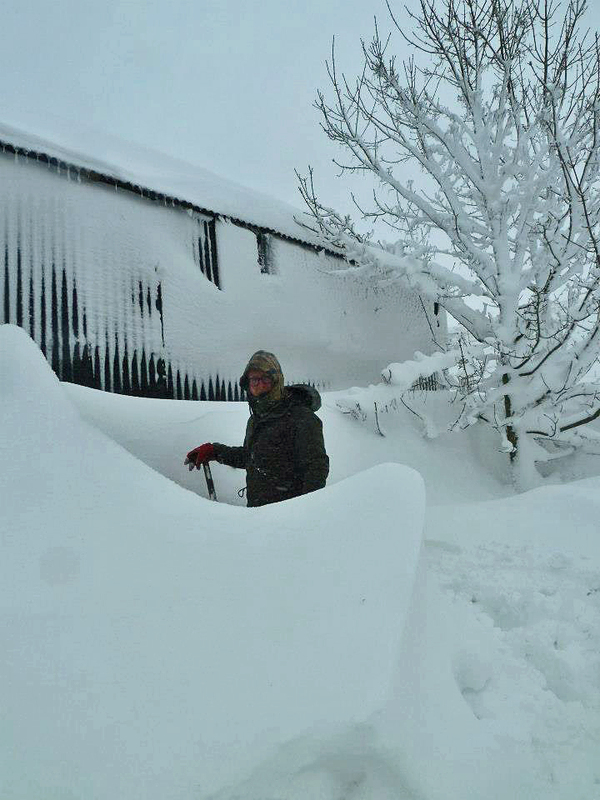 Drifts which were higher than the roof of his land rover were piled up between the dykes on the way down to the low ground, and the road out onto his side of the hill is heaped up over eight feet high with snow. Judging by the weather forecast, there is no end in sight. The snow has stopped falling, but the way it is now moving suggests that there could be some real problems ahead if this swirling mist starts to freeze. I’m worried about my partridges up on the hill, but getting up there to make sure my hoppers are full is out of the question. I have to hope that they’re tucked in somewhere out of the wind, because otherwise they won’t last long. The snow which was promised has arrived in full swing. We’ve had about a foot so far, but incessant winds have blown it all over the place so that it’s three or four feet deep at the backs of the dykes. Some of the corries up on the hill have filled with snow and vanished altogether, and travelling further afield than the wood shed is not an option. There’s none of the eerie silence of winter snow – just a caustic roar which rumbles on and on without ever seeming to slow down. I wonder if half the snow which is currently flying horizontally past my window is actually coming off the hill behind the house rather than out of the clouds. 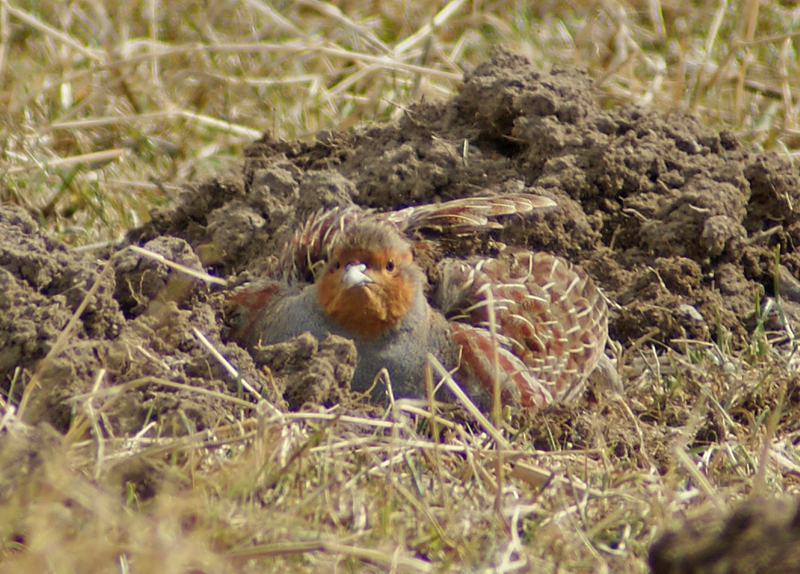 The partridge laying pens had almost vanished by the time I got up this morning, and it wasn’t easy to find them amongst the hulking mounds of white powder. The keeper on next door’s estate came over and we both agreed that the day was more or less a write-off. Having defrosted the partridges’ water and emptied the dog, the day has now become a matter of keeping the stove full of wood and throwing bread crusts out of the window for the chaffinches.